We are excited to announce our new "Member Section" of the website! You will find all of the exclusive offers for our members listed here. If you are a business owner and are interested if offering a special discount or offer to our members, please email us at info@100womenuxbridge.com. 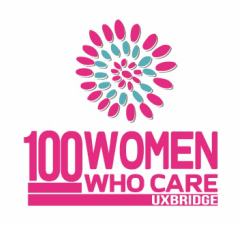 ﻿Uxbridge Town Talk﻿ is offering a 15% discount to all 100 Women Who Care Uxbridge members for any advertisement. Also Sweet World Media (which publishes Uxbridge Town Talk) will offer a 15% discount on all printing services. Lenz and Trenz is offering all 100 Women Who Care Uxbridge members and their immediate families a 15% discount on frames and sunglasses! From classic and traditional to ultra-funky and out there, Lenz and Trenz carries a wide range of styles. Be sure to stop by and see Fran for all your eyeglass needs! Optometrist on site. The best way to reduce your risk of disease and make your body run better is to eat healthy. Fruits and vegetables are two key food groups known to contribute to better health. Whether you're a busy mom hustling to feed on-the-go children, a business traveler trying to stay fit, or an active boomer keeping up with grandkids, we all want to eat right and maintain a healthier lifestyle, unfortunately, this is often a challenge. Juice Plus+ makes it simple to put more of the valuable nutrition from fruits and vegetables back into your diet to improve your health and wellness. Give yourself a better diet and a healthier lifestyle and the proceeds from you order will be added to the money raised by 100 Women Who Care every quarter. And it gets better.... with your order of Juice Plus, you can gift a FREE order to any child 4-18 years old or a full time student. That simple, that powerful for your health and their wealth. For more information please contact Melissa Hyde 416-523-6259 melissaannhyde@gmail.com. 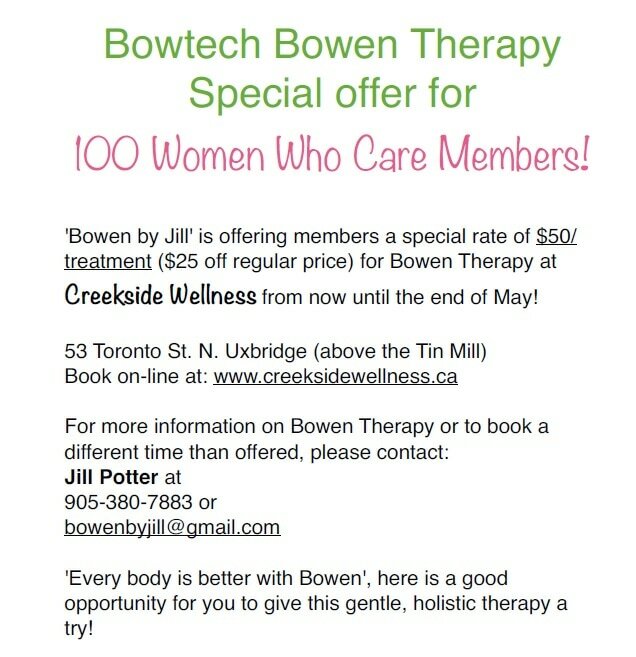 Averie Thorn-Smith is offering all 100 Women Who Care Uxbridge members a 15% discount. Be sure to contact Averie for all your Mary Kay needs! Click here for her website or call 647-999-0138! NRG 4 Life Fitness is offering all members of 100 Women Who Care Uxbridge and their immediate family members (living at the same residence) 20% off all monthly dues (Gold, Silver & Bronze). The discount does not apply to short term (student or 1 month adult) or already discounted (60+ years & student) memberships, nor one-time enrollment fee (which includes an appointment with a trainer to be shown equipment, membership card and administration). Kelley Hughes, Independent Consultant: Rodan + Fields Dermatologists is taking the world by storm! Why? Because our products are the best out there! 100 Women Who Care will receive free Preferred Customer enrollment ($25 plus tax) which entitles you to an ongoing 10% discount and free shipping. There is a 60 day empty bottle money back guarantee on all products, so you have nothing to lose, and everything to gain.